After watching my step-sister make the best smelling chilli EVER, I followed her method to make my own. Lately I've been trying to make big dishes that will last a couple of days to help us when we're so busy so this is just perfect! I've made chilli loads of times before and used different methods but this is by far my favourite way - it's fresh, healthy and super tasty. Plus garlic bread and cheese for on top! 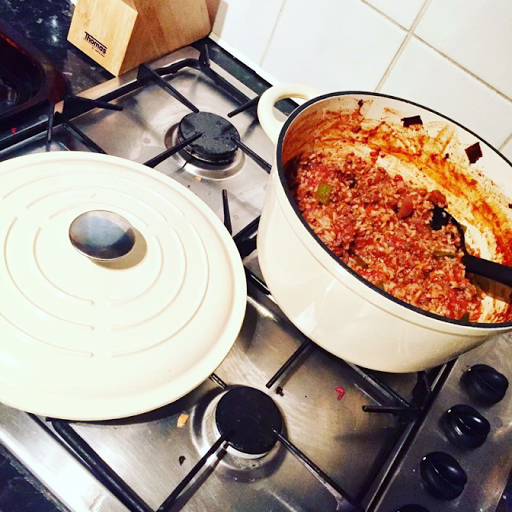 This is a great dish to make as it's super easy and after you've cooked the mince in a pan, it's an "all in one" pot in the sauce pan before transferring it to a casserole dish. I then mix in the wine and leave it in the oven for about half an hour. Simple, tasty and filling.. can't go wrong! What other hearty dishes can I make that are quick and easy during this pants weather? Tweet me links!